Canopy Growth, the world’s largest marijuana company, is set to report earnings after the closing bell Tuesday. The stock has long been popular among millennials on Robinhood, and Tuesday was no exception. Canopy Growth – the world’s largest marijuana company and the first to trade on the New York Stock Exchange – has been a wildly popular stock among millennial investors, and heading into the Canadian company’s firs- quarter earnings report, that enthusiasm was only growing. More than 26,000 investors on the stock-trading app Robinhood , which skews much younger than traditional brokerages, held the stock as of Tuesday afternoon. That’s a 179% increase in holders since the stock first appeared on Robinhood’s “Top 100” list in June. It’s now the 42nd most-popular stock on the app. Canopy soared earlier this year when Canada passed legislation legalizing marijuana throughout the country. However, it saw heavy selling Tuesday, down 7%, alongside its peers as the Ontario province delayed the launch of brick-and-mortar marijuana sales until April 2019. Analysts polled by Bloomberg expect Canopy to report an adjusted loss of $US0.11 a share on revenue of $US26.33 million. 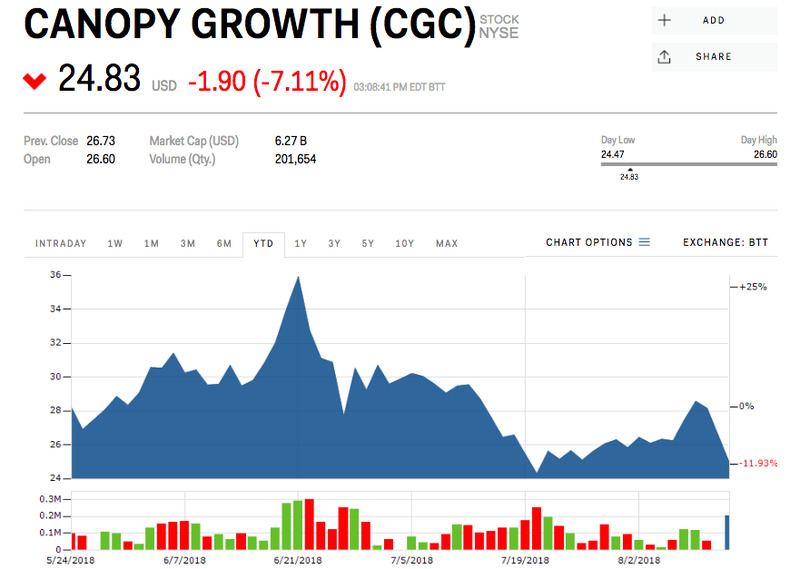 Shares of CGC have fallen by 12% this year.